"...[Alison McConnell] shares her extensive experience and knowledge of the concepts of muscle training and of the translation of this knowledge into respiratory muscle training for a variety of patient populations. Respiratory Muscle Training: Theory and Practice is the first scientific book that positions the training of the respiratory muscle pump firmly in the spotlight." 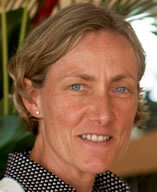 Alison McConnell in Professor of Applied Physiology at Brunel University in London (UK). She holds a BSc in Biological Sciences from the University of Birmingham (UK), a Masters degree in Human Physiology and a PhD in Respiratory Physiology from the University of London (UK). Alison is a Fellow of both the American College of Sports Medicine and the British Association of Sport and Exercise Sciences (BASES). Alison is the world's leading authority on respiratory muscle training and is the author of numerous peer-reviewed articles and book chapters. She is a regular presenter at international scientific and medical conferences. As well as being an accomplished scientist and academic, Alison is also the inventor of POWERbreathe, the world's leading respiratory muscle training (RMT) system, which she created in the early 1990s. Alison has been extremely influential in the acceptance of RMT as a treatment for breathlessness in patients with lung disease, and RMT is now a prescribed treatment within the UK National Health Service. As well as her clinical research, Alison has also pioneered the introduction of RMT into athlete preparation and has worked with Olympic and world champions around the world to help them to optimise the use of RMT in their preparation for competition. Her Book "Breathe Strong, Perform Better" was published in 2011 and is a comprehensive guide to the application of RMT to sport.